Heritage Quests: Scimitar of the Emerald Dawn #EQ2 #EverQuest2 – Nomadic Gamers, eh! I love heritage quests. They’re quests that are rich in history and lore, and typically originate in EverQuest (the first one, of course). One of the bonuses to completing these quests is that it rewards you a great looking item that’s relevant to its tier (typically, or at least it used to be, revamps have changed this quite a bit over the years), and a lot of personal and guild experience. They are a lot more involved than regular quests, and send you all over Norrath to speak with (and slay) fantastic creatures. Torrent Knights (my guild on Antonia Bayle) is slowly inching towards level 70. We’re almost at 69, and I’m incredibly excited. At level 70 I plan on purchasing a T3 guild hall (yes, right before T4 is released, I know, but we’re a long way from meeting the requirements on that one) for us to use and decorate. As such, I’ve been trying to complete as many heritage quests, adventure writs, and craft writs as I can to nudge us closer. I decided instead of working on Heritage quests from the easiest to the hardest (which would also be working from the least amount of status granted to the most) that I would start at the bottom of the list and work my way to the top. So far I’ve completed 37 on the list with Stargrace (who I consider at this time to be my ‘main’). Waters of Norrath was the latest heritage quest that was added with Chains of Eternity, and rewards players with a really neat cloak. The quest is quite easy and can be completed solo until the final fight which is to defeat Santii in Cobalt Scar. She has a horrible skill called ‘clinging mist’ that drains mana from the group and knocks them around, it CAN be interrupted but it’s quite a fast cast and it only takes one resisted spell to cause issues for the group. That does not mean it’s impossible, I’ve defeated her twice so far, neither time was with an enchanter (they can do some great stuns and have mana regen) or a bard, and neither time was with a full group. Of course having those things does make it easier. 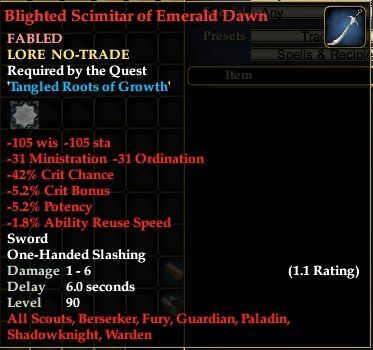 My latest endeavour was to complete the Blessed Scimitar of the Emerald Dawn, which came out with Destiny of Velious. The other neat thing about heritage quests is that they typically also reward you with a house item, either the item itself can change into one, or they’ll give you a second version. For the scimitar I actually got an appearance version (which is great, because the actual version is for fury /warden only), a house version, and the weapon itself. I also got a neat tombstone looking item that is a book. I put the house items in my museum, where I have an entire room dedicated to heritage quests. I also completed Snowchipper, which was a really quick quest that also released with Destiny of Velious. That expansion was great for heritage quests, there were 6 released with the expansion, whereas there was only one released with CoE. I’m not sure if any are being released with ToV at this time. Next on my list? The lodizal shell shield. Do you enjoy completing heritage quests? They make for fantastic guild events, especially if you can get multiple groups of people doing them.